Last Friday I finally had the perfect confluence of events and ingredients and weather. Fifty mile per hour winds and blizzard-like snowfall. Everyone home all day long. The driveway buried under twelve inches of fresh white stuff. And I had all the ingredients I needed. It was kismet. As the scent of onions, garlic, tomatoes, chicken and Mexican herbs and spices started filling the house, I knew we were heading in the right direction. As the smell wafted through the house, I started eyeballing my children wondering which one of them I could nibble to hold me over until the soup was done. Thankfully, I didn’t have long to wait. This soup, while it can be an all day simmer-er, is more than merely delicious in under an hour. I could kick myself for not having made it sooner. Hard. And repeatedly. And once more with feeling. It is so good. Even my “I don’t wike vegetables” gruesome twosome loved it. In fact, they had seconds. The Evil Genius and the three eldest Minions declared it to be One Soup to Rule Them All. Let’s break down what makes this particular soup so satisfying. In it’s essence, it is a bowl full of everything I have ever loved about Mexican food. Bold flavors, savoury beans, smoky chiles? Yes, and in abundance. Moist chicken, corn tortillas, fresh jalapenos, creamy avocados? Check, check and check. 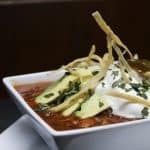 If you’ve never eaten tortilla soup before, it is easiest to compare it to the flavors of chicken enchiladas. The chicken and tomato based broth is the perfect vehicle to deliver the ultimate in Mexican comfort food. My recipe makes a monster quantity of soup. I didn’t down-size it for two solid reasons. Leftovers freeze like a dream. You can portion out family or individual sized servings and stash them in the freezer for fast meals. You’ll be so grateful to have a stash of this frozen to deal with last minute Tortilla Soup cravings because they. will. happen. When you’re ready for it, simply reheat and garnish. In big heavy pot, warm olive oil over medium heat. Add onions, garlic and a pinch of salt and sweat until semi-translucent. Add tomatoes, stock, chili powder and oregano and bring to a boil. Simmer for 10 minutes. Add beans, chicken, jalapeno, and minced tortillas and return to a boil. Drop heat to mid-low and simmer another 10 minutes. Test the thickness and seasoning of the soup. If you want it thicker, add more minced corn tortillas. Adjust seasoning with salt and pepper. You may find you need to add quite a bit of salt, but add it in small increments. It’s always easier to add salt than it is to take it out! Continue simmering for about 25 minutes. Remove from heat and stir in lime juice and cilantro. Serve with desired garnishes. *Ungarnished leftovers can be portioned into serving size containers and frozen for future meals. **To make fried tortilla strips: Add about 1-inch of canola or peanut oil in a heavy bottomed pan. Heat it over medium-high heat. Slice desired amount of corn tortillas into strips, thick or thin according to preference. Drop one strip of tortilla in to the oil. If bubbles form immediately around the edges and it appears to be boiling, the oil is ready. Drop a handful of tortilla strips into the oil and stir to separate. Fry about 1-2 minutes then use tongs to transfer to a paper towel lined plate. Sprinkle with salt and seasonings if desired. I used a stock that was based on my basic chicken stock, but simmered with an additional head of garlic and a couple dried arbol chile peppers. It added a wonderful depth of flavor to the final soup. If you have time or the inclination to make your own stock for this soup, I highly recommend it. Will this still be good with purchased stock? You betcha, but you may find you need to up the spices and garlic a bit. Just taste it before serving and adjust. Likewise, I used home-cooked black beans simmered according to this method with a smoked pork neck bone. The hint of smoky pork in the beans was not assertive, but added another layer of flavor that really upped the deep flavor quotient in this soup. You can use drained, rinsed, canned beans if dried beans are not available. I like my soups with a lot of body and thickness, so I used both the optional tomato paste and the additional minced corn tortillas. If you prefer a brothier soup, use the smaller amount of minced tortillas and omit the tomato paste. 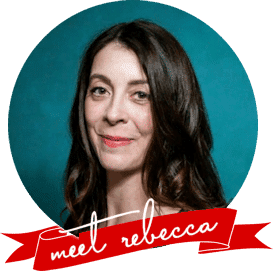 Because I love you all so much (and because I have a new puppy), I’m giving away one jar of my homemade Candied Jalapenos to two of my readers. It’s a little thing, really, but it’s from my kitchen to yours. If you like jalapenos, you’ll love these addictive little babies. 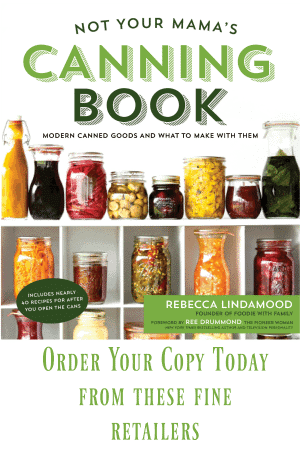 Remember, this is a home canned item! To be entered to win, just leave a comment below telling me what you’d do with the jalapenos or what you had for dinner last Friday. Or just talk to me about puppies. I’m easy. This just in… Because I love you all bigger than the bay, I’ll also give away a third jar to someone who “Likes” Foodie With Family over on Facebook. Have you seen the Facebook page yet? We have loads of fun over there. Sneak peaks, ridiculous confessions, and good clean (mostly) fun. In one bowl of this Best Tortilla Soup is everything I have ever loved about Mexican food. 3 cups cooked black beans I simmered mine with a smoked pork neck bone but you can use drained, rinsed, canned beans. 10 cups chicken stock I used homemade garlic chile chicken stock but you can use purchased chicken stock and increase the garlic by 3 cloves. 6 ounces tomato paste Optional. Add if you like a thicker soup. 4-8 corn tortillas minced These are going to thicken the soup, so add the smaller amount first. Add more if you want to thicken up the soup more. Add beans, chicken, jalapeno, and minced tortillas and return to a boil. Drop heat to mid-low and simmer another 10 minutes. Test the thickness and seasoning of the soup. If you want it thicker, add more minced corn tortillas. Adjust seasoning with salt and pepper. You may find you need to add quite a bit of salt, but add it in small increments. It's always easier to add salt than it is to take it out! Continue simmering for about 25 minutes. I would…eat them? On everything? Seriously. please! i would love one of your cowboy candies! i adore your website and have used many of your recipes. i love canning with your site. cowboy candy is great in sandwiches! what kind of puppy do you have? you are so lucky,the puppy is too! Friday’s dinner: Homemade bolognese sauce with homemade tagliatelle. I’d probably snack on them. and put them on nachos, or chili, or my mexican turkey dish, or on a buffalo chicken wrap, or pretty much anything. one thing i would not do is share them with my dog! I would love to try your cowboy candy. I was thinking it would be good on a chhese steak sandwich. I also make green chile burros and think it would be a great garnish for them. What wouldn’t I do with candied jalepenos? I’m cooking to impress my boyfriend so there’s a very 1950’s stereotypical chance that these babies might help me reel ’em in! I had takeout chinese Friday night. Long day at work. Don’t judge me. I would make my husband eat one plain, just to try it…then we would eat them in this soup! And I like your new puppy, too ;). Oh, and on Friday, we had….Hungarian Goulash in the Crock Pot. There! Last Friday, Jon made pizza and it was AMAZING. The adult pizza was covered in our home-canned hot red peppers, onion, and mushrooms. And cheese, of course. And what would I do with these? I’d probably make The Pork and The Black Eyed Pea Salsa and eat it all together. And as for puppies? They are wonderful at other people’s houses. I would love anything that came from you. I Love your recipes and blog. I made lasagna roll ups for Friday Night supper. It was a nice change from the regular lasagna. Why, I would eat them with this soup! After eating some straight out of the jar. I make a tortilla soup that is similar to this, but not quite the same. I like all spicy chicken and bean soups, though, so I’d be thrilled to try this one. I would probly put them on just about everything! Especially on my sandwhiches I take for lunch at work. I’ve been wanting to make the candied jalapenos for a long time now, but it just hasn’t happened. I love your blog and use several recipes from it, much to my family’s delight and gratitude. I would LOVE a jar of these =). I’ve been dying to try them ever since you posted them in the first place, but I’ve been putting off any foray into canning till next year when I hopefully have my own place. I would like to try them on their own, on a grilled chicken pizza with tomatoes rather than sauce, and on some sandwiches. What kind of puppy did you get? Eat them with cream cheese and crackers! They’d be fabulous on with tuna or to top off a taco salad! If given a can of your candied jalapenos, I’d serve ’em up on a nice dish as an appetizer at my next party! Oh my goodness, I love tortilla soup, but I’ve never made it. I love putting pickled jalapenos in my sandwiches. Yum. i’m so intrigued by your jalapenos–I’d love to try them! 🙂 Thanks for the giveaway! I had Chili last Friday that my husband made..win win in my book! I love Chicken Tortilla Soup and i think if I were to win the jalapenos I would have to try them with the soup! We have 2 little love “munchins” puppies. (a Silky and a Yorkie) both about 8 lbs and give puppy kisses all day. So loving. Would love your cowboy candies. Never had candied jalapenos but they would have to be good. I would probably fill them with cream cheese and snack on them or maybe put them in cookies. Who knows, but we love jalapenos. I would hide them and hoard them and only eat them when the husband and the son are out of the house! Candied jalapenos sound absolutely divine and I would be thrilled to receive a jar. I would love to win a jar of the Cowboy Candy! Dinner on Friday was smoked turkey sausage hoggies on homemade buns with a casear salad. I think a jar of Cowboy Candy would have taken the hoggies over the top! Haven’t commented before, but I am a regular reader of your blog. I love your writing, humor and recipes, of which I have made many! Eat them with cream cheese on toasted baguette! Perhaps with smoked salmon. Not sure, but I would have fun experimenting. If I had a jar of your Cowboy Candy, I would mince them to use as kicker in double chocolate chip cookies or brownies. I might even chop them to use in Spanish rice. That is, if I don’t eat them all right out of the jar first. I would love to serve my favorite cowboy (and bottomless pit), my 16 year old son, that Cowboy Candy if I won a jar. I think it would go great with his favorite Cowboy Beans, that have to be cooked over a campfire! I fed him some of your wonderful Bacon Jam and he is so hooked, that he had me sign up for your email updates. I’ve tried several of your recipes and they are always so good! Thank you for the fun blog. Enjoy those puppies. The “cowboy” would be lost without his two old “puppies” that have been his best friends for most of those 16 years. I love to put candied jalapenos on a pimento cheese sandwich! I know I can’t win a jar cause I’m family but maybe you’d have a soft spot for your dad and send one anyway. So, here’s how I would use them.. I would eat them in a car, I would eat them near and far. Just made a pot of this and it is delicious! I love that it is basically a “pantry” recipe. I didn’t have leftover chicken (I never do!) so I poached 4 boneless breasts in chicken stock while I was prepping, shredded them up and put them, poaching stock and all, into the soup. I think if I had any candied jalapenos I would eat them standing up in the kitchen. Those candied jalepenos would be great to serve with cheese, crackers to my friends…and me, I’d eat ’em right from the jar. Yumm, your candied jalapenos would be glorious! I just discovered your blog a few weeks ago and bookmarked that recipe. I can’t wait for this summer when I have lots of jalapenos to make this. I’m sure I would share these with my husband, unless he hides the jar so he can have them all to himself. But the package will be addressed to me and he doesn’t open my mail….What did I have for dinner Friday? I can’t remember that far back. Saturday I had Pizza & Salad, and yesterday I had Lime/Herb grilled chicken that was tangy and delicious, rice and salad. Your daddy is funny! And I like you on Facebook. Coming from a Czech/Slavic background simply kept me sheltered from anything spicy, but you have inspired me to be daring on several occasions with your brilliant recipes. You have greatly enriched me and my family’s lives! This soup looks like another one I will have to try. We live in Montana….but love Mexican food. There’s not a lot of Mexican food here. We like to “KICK” everything up a notch. My husband would put these hotties on everthing he eats….